Leading Manufacturer of anti-diabetic herbal medicine and herbal antidiabetic medicine from Mumbai. Anti-Diabetic Herbal Medicine is intended to regulate the blood cholesterol level of persons suffering from diabetes. The natural ingredients contained in this formula to treat diabetes are believed to be effective to facilitate cell growth and insulin production in the body by encouraging insulin synthesis process. 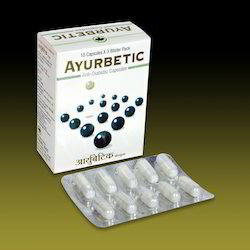 AYURBETA Capsules is intended to regulate the blood cholesterol level of persons suffering from diabetes. The natural ingredients contained in this formula to treat diabetes are believed to be effective to facilitate cell growth and insulin production in the body by encouraging insulin synthesis process. Looking for Diabetics Care Herbal Medicnes ?